Dear visitors, i hope you like these cute and nice ceramic bird houses list! This little colorful ceramic bird houses are made of hand glazed porcelain. The house comes in a 5.5" x 5.5" x 7"H size. This birdhouse is designed with a metal hanger for easy placement indoor or outdoor. The bee hive birdhouse comes with a cleaning hole at the bottom. You can easily remove the dirt and old nest material from birds. This can be used as decoration but it is a functional bird house. It is best to place it next to a tree or some other vegetation so birds feel secure. Other good places can be under a roof or next to a barn. Birds love to feel protected from predators and to have a place to rest like a branch next to a bird house. 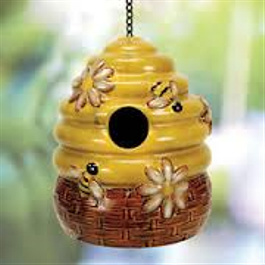 Check the price of Nature's Garden Bee Hive Birdhouse here. The hand glazed porcelain makes this functional birdhouse very cute. There is a strong metal chain attached to the house and it is easily hanged. The birdhouse is designed with an easy access cleaning hole at the bottom. You can clean it when birds are not using it. 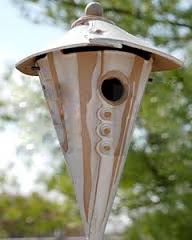 As it is a functional birdhouse you can use it to attract small song birds like wrens or chickadees . It is best to place it next to a tree away from wind. Small birds like to nest in shade, so never place a bird house in direct sun. Find a quiet place where birds will feel secure. Check the price of Nature's Garden Modern Vintage Bird House, here. The adorable owl colorful ceramic bird houses are hand glazed. The design is ina ashape of an wol, and there at two entrance holes for the birds. It is a functional bird house, it can be used just as a decoration to if desired. Comes with a good sturdy chain to hang it. The bird house is equipped with a cleaning hole at the bottom so you can remove the material at the end of the season. You can wash the bird house I water, but check that birds are not using it. This bird house will attracts small song birds, and can be used as a decoration only. If you want birds to nest in it hang it next a tree, under a roof or some other form of protection. Birds will not nest in it if the birdhouse is exposed to direct sun light. Find a nice spot in shade and with some quiet. 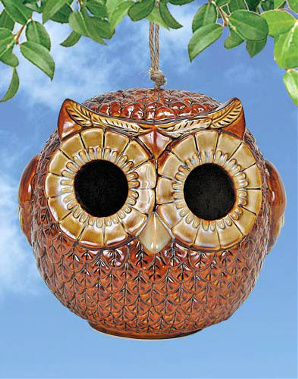 Check the price of Nature's Garden Owl Bird House here. This colorful bird houses are made in a shape of a large pine cone. The color is brown and makes great birdhouse to camouflage in nature. The birds love colors that are natural and will use this birdhouse for nesting or roosting. The birdhouse is not equipped with a cleaning hole at the bottom, so cleaning is not as easy as with other designs. The good thing is that birds are clean tenants and never do nasty thing in the house. You will have to take the bird house down when season is over and take the nesting material with your fingers out of the hole. The bird house is washable in water. It comes with a hemp rope to hang it. You can change it to a chain for better stability if you want. Best spot to place it is next to a tree in a shade, where you can watch the birds but not be to close. The color and design makes it blend with the natural scenery. 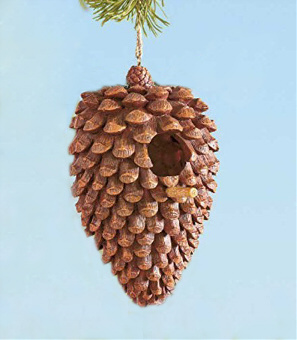 Check the price of the Large Pine Cone Shaped Birdhouse here. This is a hand made ceramic bird house, made from quality clay stabs. This cone hanging birdhouse features a tapered/conical shape that will look enchanting in your backyard or patio. Each birdhouse features an 1.25" opening that is great for attracting small song birds. 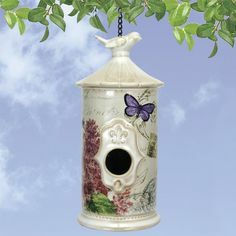 Some species that this birdhouse will attract are : chickadee, wren, warbler, nuthatch, titmouse, or similar nesting birds. Larger birds will not be able to nest in such small openings. Each birdhouse is equipped with a flat surface platform that is perfect for nesting. The top of the birdhouse is removable and provides an easy access for cleaning. Cleaning is easy and can be done at the and of each nesting season. You can use water and soaped, small brush will do the job and reach the small corners. This house is weather resistant and color will not fade on the sun. When placing the birdhouse, find a quiet place, away from direct sunlight. I recommend you to hang it where there is no strong wind. Under a tree, balcony or on the side of a house are some good places you can hang your stoneware birdhouse. This birdhouses come in in royal blue, butternut gray, and teal green color. It is important not to place the birdhouse next to a door, to much traffic or where cats can get to them. Birds often fall prey to cats and hawks, so place the birdhouse where they cannot sneak on them. Check the price of Hanging Stoneware Cone Birdhouse here. What is the Perfect Place to Install a Birdhouse? There are number of methods to install Birdhouses. Birds will often select places they are more comfortable with, so if a present birdhouse area is not getting any tenants, it may be time to find another location. Birdhouses should be positioned at locations that limit number of possible predators and human disruptions; nevertheless, oftentimes these tips cannot be fulfilled. The best recommendation is to mount the birdhouse in the perfect location because of the restrictions on your lawn. Birdhouses positioned under roof or eaves will be open to less amount of moisture and eventually stay for long time. Apart from this these sheltered locations will be much more advantageous as they are hard for predators to reach as well. Birdhouses have to withstand winds in all seasons and should be placed an adequate range from the ground. Various birds require different amount of spacing for birdhouses. Some of the birds, like wrens, are extremely territorial and can fill up various birdhouses from the location with temporary or dummy nests. Should this happen, take away the temporary nests frequently to permit other birds to claim these un-utilized birdhouses. A dummy nest will not include a nesting cup for eggs, as most of the time it is filled completely with big twigs stopping other birds from easily entering the birdhouse. Ultimately, birdhouses should installed be at reasonable distance from the bird feeders, because feeder usually attracts predators that may prevent small birds like songbirds to nest close by. Many species of birds are naturally territorial. Some varieties choose to home very far from other birds of the same varieties, while other varieties can stay as near as 5 m (15') from another birdhouse. Too many birdhouses in the same area may cause some birds not to build their nest while other bird varieties, such as wrens, will be forced to fill up the birdhouses within their area with brush as well as other materials to avoid other birds using their so called nest-boxes. These nests are loaded rapidly by male wrens if they are being emptied every day. Though other direction will do, facing birdhouses east is regarded as the best. If it’s a summer season, it may be preferable to deal with entry holes on the east to avoid overheating due to hot afternoon. Birdhouses having entry hole on the east get morning hours sunlight as the birdhouse is chilly from the night before. Steer clear of dealing with birdhouses in the direction of existing wind. Birdhouse entrance doors should also be installed away from bird feeders, in this way nesting birds does not get agitated when possible predators go to the bird feeder. How much Higher to Install a Birdhouse? Depending upon the bird varieties, the birdhouse should be installed inside a specific elevation range. Among each species there exists a range that is right to install your birdhouse. However there exists some exceptions and birds often nest outside these ranges, particularly if there are any other nesting cavities in the region. Birdhouses designed for nuthatches, chickadees as well as wrens can be installed around 1.5 m (5') over the ground. This will make it easy for you to clean up the aged nests and find out if the birdhouse is engaged since because of the height of birdhouse entrance hole you can clearly see. Bird feeders attract an assorted populace of birds, a few of which may be predators or territorial birds that are nesting in your birdhouse. Make sure to keep birdhouses at a minimum of 5 m (15') away from bird feeders to provide some range between the two. In case your backyard is small, and the distance between birdhouse and bird feeder will not be ideal, use bird feed that draws in certain types of birds and does not attract possible predators. The safety for any birdhouse comes from its place where it is kept. Attempt to always hang up the birdhouse on place having a shade to protect it from the warmth during the hot hrs of the day. Some birds throw their droppings directly out of the nest, therefore you might want to steer clear of places where waste could be a nuisance. So, when you have selected a decent area that gives basic safety towards the birdhouse and its inhabitants, your curiousness, excitement and the wait begins to see if your little birdhouse is going to be visited by some new bird family.